As soon as I tasted their espresso, I wanted them as a client. The owner of this unassuming Brooklyn shop sources mind-blowingly great coffee beans from East Africa and Latin America, roasts them to perfection at a cooperative facility on the Brooklyn waterfront, and then works some kind of dark magic at the espresso machine. I’ve had a shot or two almost this good Portland. No such luck yet in France or Italy. The only thing missing was a web presence worthy of the coffee. This branding and content campaign is a work in progress. I haven’t slept in weeks! We bring our neighbors together around the world’s greatest coffees. We buy from East African and Latin American farms that grow amazing coffee beans, and are committed to seeing that these farmers are paid fairly. By building long relationships we help them work toward a sustainable future. Every week we roast the beans ourselves in Brooklyn, NY. It’s an intensive process—part science, part intuition, and part obsessive tasting. Our goal is to celebrate the unique, nuanced flavors of each farm and region. While we serve all kinds of coffee drinks, from simple to complex, we call ourselves an Espresso Bar. Because our success is built on this most fundamental expression of coffee: a sip that captures the spirit of the farmers and the essence of the land. If it’s been a while since you’ve had an espresso, we invite you to taste what you’ve been missing. 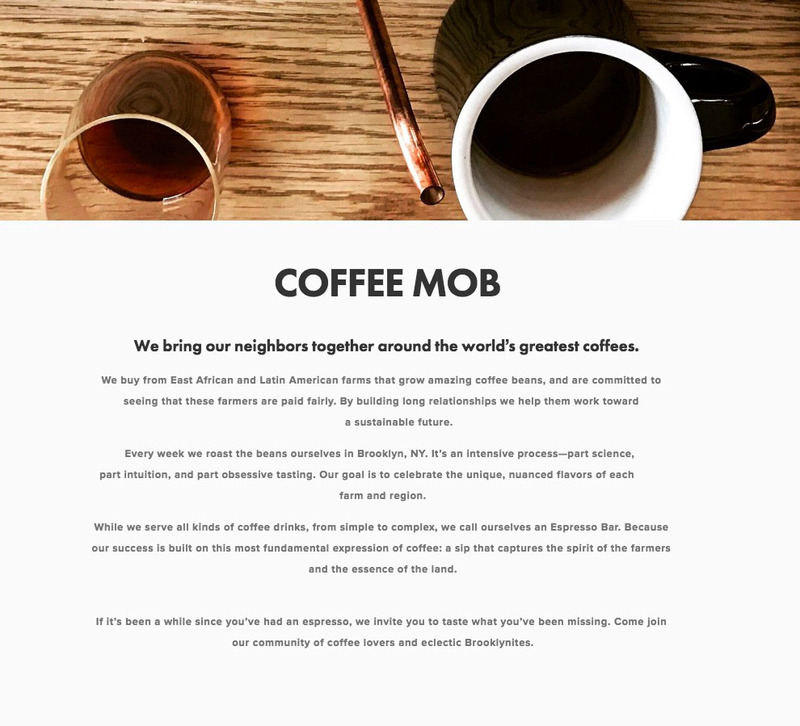 Come join our community of coffee lovers and eclectic Brooklynites.